Have warning gone to far? 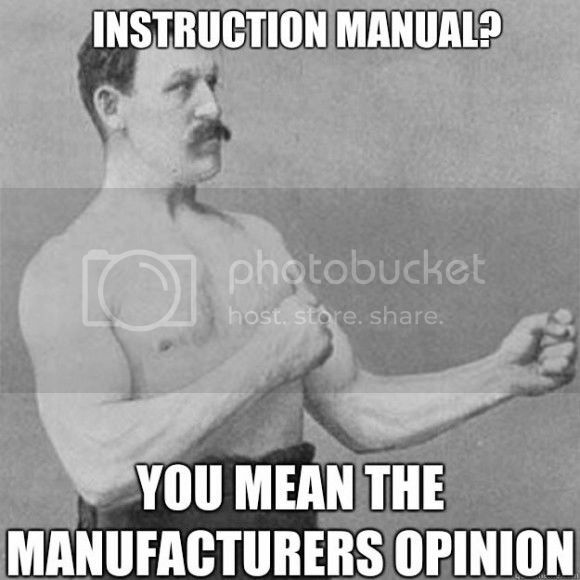 Ok so being someone that reads/watches the installation videos before fitting bike parts(obviously I'm not a real man) , Iv now become staggered as to how much of the manuals are filled on warnings. I understand the need for manufactures to cover them selves legally, but has it gone so far as to be ridiculous. This is my example: on going to fit a rock shock reverb I was told one of the procedures performed incorrectly could kill me :o is this riding the bike while juggling chain saws? Not putting the saddle on? :o I'm afraid not its if you don't use friction past on the seat post, as obviously AE is full off patients each weekend from their seat post sliding down ever so slightly and causing serious injury or death : some how I think this could be an overstatement it might at most make the person annoyed to have to keep adjusting there seat post. My point being with this is theses sort of mad warnings mean we don't even bother reading the warnings anymore, making the ones we should take note of unknown to us. Or even worse ignore them all as being over drivel. More to the point, you had to watch a video on how to install a seat post?!!? Oh yeah, and warnings have gone too far. Does anyone remember the best invention in the world, the self heating can of coffee? Some dilbert got them banned because he didn't read the warning "contents may become hot" and burn himself. Just goes to show that even if you do put sensible/ridiculous warnings on things some halfwit will still injure themselves and get everything banned. &quot;Jon&quot; Wrote: More to the point, you had to watch a video on how to install a seat post?!!? Manufacturers need to cover themselves simply. Some dunce will injure themselves then run crying to a lawyer otherwise. I wonder if it's safe for me to get out of bed without reading any health warnings? Crazy! That one at least has a reason. Pedal reflectors are a legal requirement for bikes on the road. &quot;Yankee&quot; Wrote: That one at least has a reason. Pedal reflectors are a legal requirement for bikes on the road. Makes sense as you've said, although I did find it funny to get a bell, reflekters for the wheels and front/back for the frame with my dh bike. As said its compulsory to sell them with all this even if it's not for road use.